S.J. 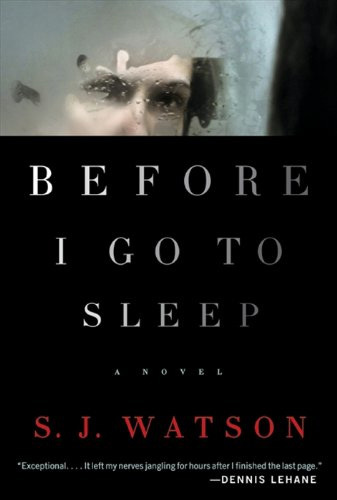 Watson’s Before I Go To Sleep is not the sort of book our book club typically selects, but for October (yes, sorry, I’m late) we wanted to read something a little different. None of us were disappointed. This psychological thriller centers on a Christine – a woman who, because of a severe trauma she experienced, suffers from amnesia, and her sleep erases her memory. The book opens with Christine getting out of bed with someone who doesn’t seem familiar and looking into a bathroom mirror at a much older than she recognizes self. Her husband, Ben, has to remind her every morning before he leaves for work of her circumstances and with enough instructions to get her through the day. Most of the narrative is from this journal, and as it catches up to present time, the thrill of the chase is on. A quick and easy read, this is one you won’t want to put down until the very end. Before I Go To Sleep comes highly recommended from all of the girls in my book club as an entertaining novel.